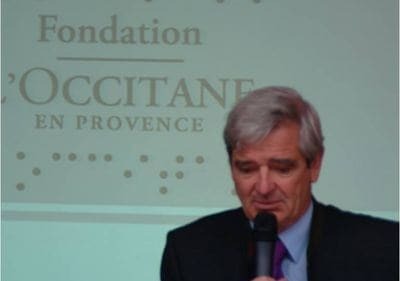 The L'OCCITANE Foundation was created in 2006 to drive and bring together the actions of public interest in which L'OCCITANE had already been involved since its beginning in 1976. "Social action is an essential part of L'OCCITANE. The Foundation means a lot to me. I am delighted to follow in the footsteps of a company that has always had very strong, deeply rooted values – and to make these values my own. I am proud of all of these actions. And I hope that everyone at some point will take up the baton and become a spokesperson for the Foundation with the same sense of pride." "The soul that has been at the heart of L'OCCITANE for the past 30 years is behind the birth of this Foundation. It only exteriorize what is already inside. Every action of the Foundation comes into resonance with the brand. These projects crystallize and get organized through the Foundation, L'OCCITANE internal mirror ... We show the soul of L'OCCITANE, we show it a little bit more because there are well thought out actions and not destined to the general public in order to be in demonstration. The role of the L'OCCITANE Foundation is to catalyze all these energies and organize these projects to create a real consistency between the true stories of L'OCCITANE and the Foundation's actions."